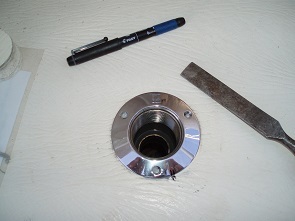 The hole through the deck for the stainless steel deck fill is first drilled from underneath with a 6mm drillbit, and then drilled from above with a hole cutting tool. 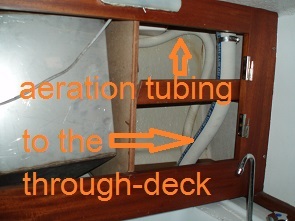 It was drilled with the center 70mm from the inside of the cupboard top, and 90mm from the right wall of the cupboard (see drawing). 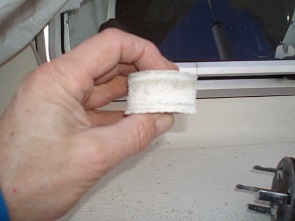 The deck is about 40 mm thick, including the plastic foam filler. 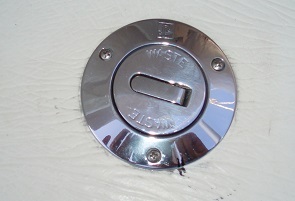 The hole and drilled screw fitting holes is covered with epoxy compound before fitting in the new through-deck fill. 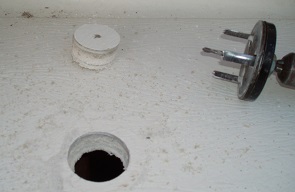 Then the deck fill is placed in the hole and aligned with the screw holes. 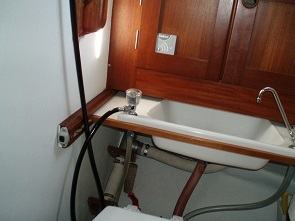 See the small stripes that were put there before applying the epoxy. 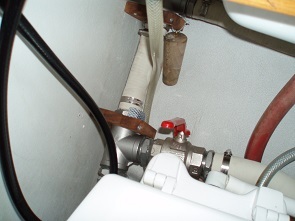 The screws are put in place and then the 38 mm sanitation grade hose can be fitted from beneath with stainless steel hose clamp. Now we are ready to put the rest of the 38 mm sanitation grade hoses in place. 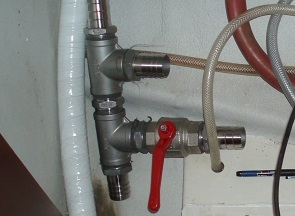 The double stainless steel T-connection in the 38 mm hose going from the septic holding tank to the seacock outlet is ready. 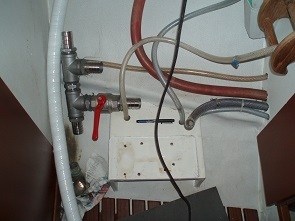 This is how it looks in the right side cupboard, with the 19 mm id vent pipe hose of the septic tank, and the 38 mm hose to the deck fill. And this is how it looks when the cupboard doors are back in place, with the Gobius control panel to the left. 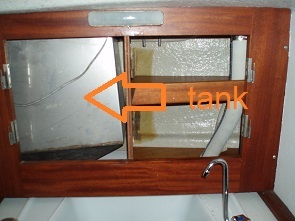 Now we are ready to install the Gobius tankmeter on the inside of the cupboard with the tank. I tapped the 12V DC power from the light fitting in front of and above the cupboard. 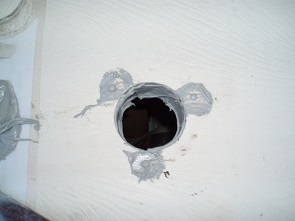 A thin hole is drilled and filed through the cupboard door, using the template from Gobius. 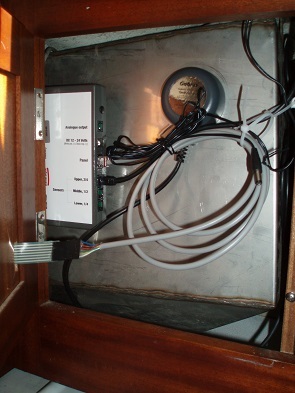 The wiring and control unit are in place. 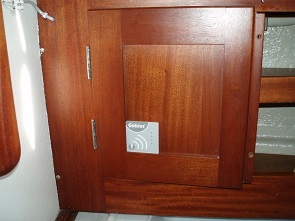 And the control panel is put on the outside of the cupboard.